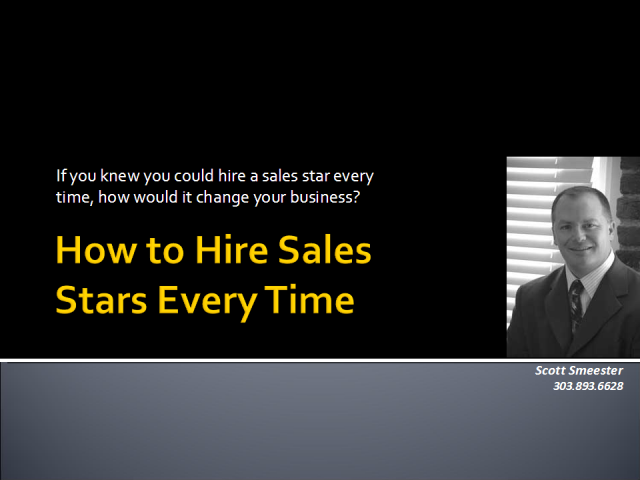 Is It Painful to Hire a Salesperson Who Doesn't Sell? STOP GUESSING IF YOUR NEW SALESPEOPLE CAN AND WILL SELL!! You no longer have to guess if a salesperson will actually be able to sell or not, regardless of how great their resume looks or how well they personally connect to you on an interview. You now can know if the sales candidate you are interviewing has the skills so they can sell what you’re selling and the motivation so they will sell what you’re selling. We can show you a reliable and repeatable sales recruitment process that weeds out non-performers even before you interview them. This proven system greatly reduces the cost of turnover and establishes a process to successfully recruit and maintain an unbeatable sales team.